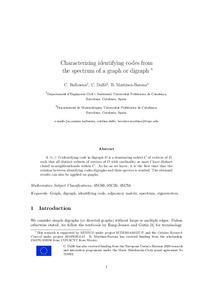 Balbuena, C., Dalfo, C., Martínez, B. Characterizing identifying codes through the spectrum of a graph or digraph. A: Algebraic and Extremal Graph Theory. "AEGT 2017: Algebraic and Extremal Graph Theory: University of Delaware, USA, August 7-10, 2017: proceedings book". Delaware: 2017, p. 1-10.